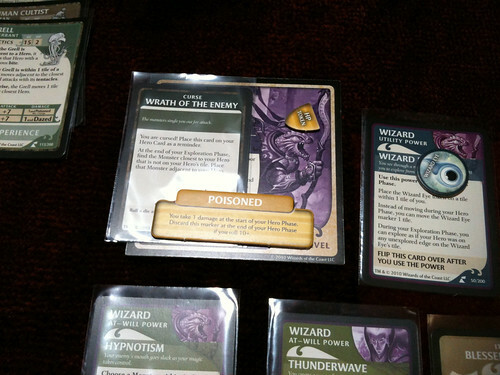 Reduce Encounter cards drawn when meeting a Villain by 1; 0 is allowed. 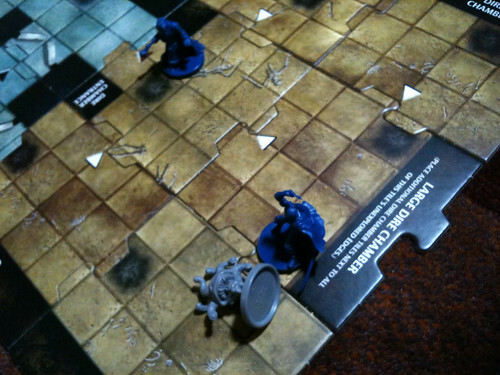 Placing the special tile of the Adventure after the (5 + (number of players))th tile. For any naysayers out there: the game was built to be house-ruled, and in any case enough randomness happens such that it’s likely that you will not reach the tile in the allotted number of exploration phases—sentry monsters and a few encounter cards come to mind that all draw from the bottom of the tile stack. The 9 HP of Gauth were taken out by Heskan’s Spectral Ram (3 points of damage) and Kat’s successful Deep Cut (4 damage) in combination with the Vorpal Sword (plus a Lucky Charm to roll a 19 for +1 damage) and Gauntlets of Ogre Power (+1 damage) took out Gauth, when Heskan was one hit point away from dying with no surge tokens left. Victory would have been easier with (a) a Fighter with a supporting Hero, (b) carefully chosen power cards, and, as always, (c) better luck, although it was mitigated by the house rules. Drawing a Treasure at the beginning of the game, as the rules laid out and which I cheerfully ignored for several games, really do help. 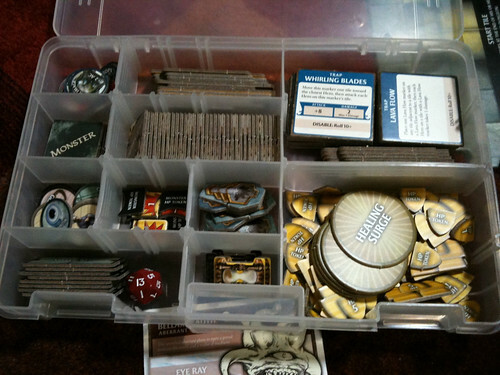 I plan to do the same with Castle Ravenloft. WoA is my favorite right now, so the heroes live in that box. 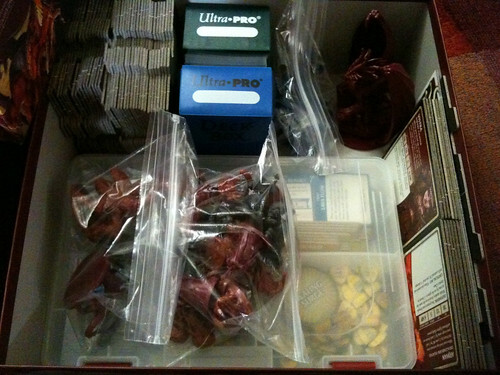 On the other hand, atmospheric stuff (monsters, the decks, the tiles) stay in their respective boxes. Everything goes in quickly, gets set up quickly, and that’s the best I ask for in a quick Crawl-like, including the dire need to consider all options where items are concerned.